Been needing that computer fixed? How about your gutters cleaned? A server for a romantic dinner? Someone to dig a hole and then fill it back in for four hours? Roos can do that! The Valley Kangaroos are excited to invite you to the return of our live player auction! On Saturday, April 6th, starting at 5pm, you’ll have the chance to battle against your fellow bidders for FOUR HOURS of our volunteer Kangaroo’s time, as well as a variety of other prizes. 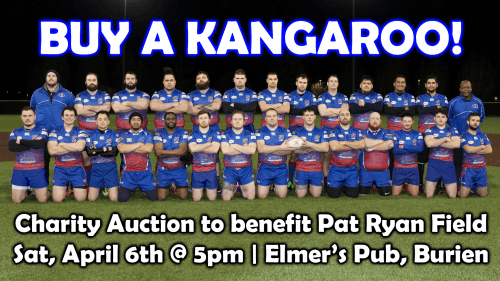 All proceeds benefit the Valley Kangaroos RFC and help with the ongoing maintenance of Pat Ryan Memorial Field, home of both Valley and Liberty rugby. Hosted at Elmer’s Bar & Grill, feel free to stick around for live music after the auction.